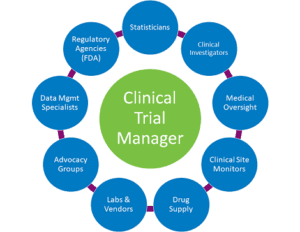 The Clinical Trial Manager plays central role in the clinical trial process. We conduct searches for clinical trial managers to our pharma, biotech and medical device companies for full time or staffing arrangements. Candidates interested in being considered as positions become available should contact our clinical research talent manager. This position will be responsible for the operational management and the oversight of clinical trials within a clinical development program. This individual will be responsible for the successful execution of clinical trials from the protocol concept through the clinical study report, ensuring completion of study deliverables. Providing oversight of the CRO and other third party vendors on assigned study. The Clinical Trial Manager will work closely with a Project Leader, or Pharmacovigilance, Regulatory, etc., and will report into the Clinical Operations Manager.